The new Honda Amaze made its world-premiere at the Auto Expo 2018 in February this year. 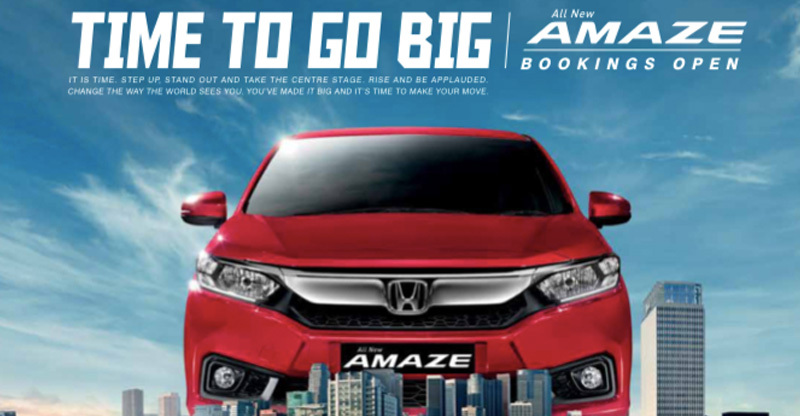 Honda Cars India Ltd is now all set to launch the new-generation Amaze next month. Bookings for the upcoming Maruti Dzire challenger are already underway. The company has updated its official website with details of the upcoming car. 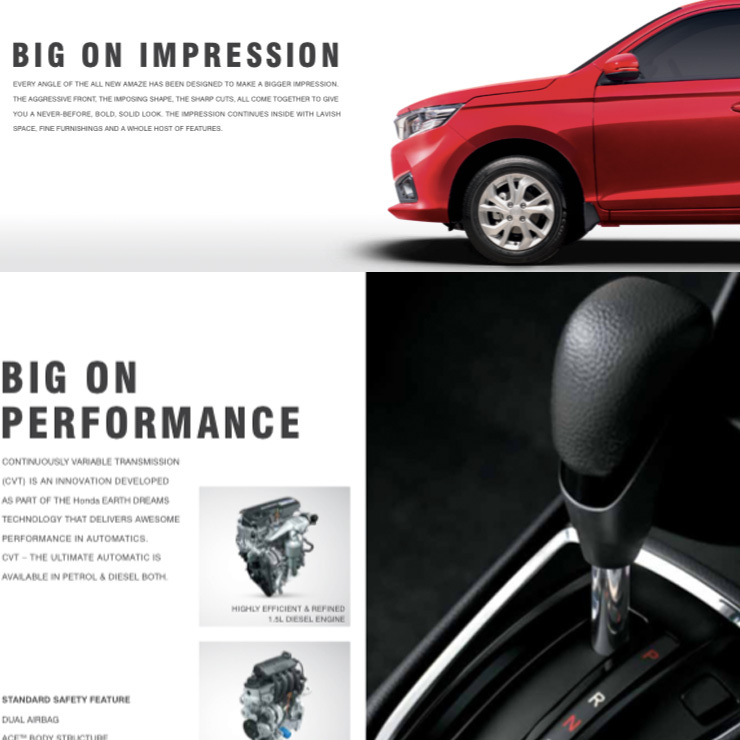 The official website also gives an option to the interested buyers to access a brochure. That said, the brochure doesn’t reveal anything new about the car’s specifications. However, it does talk about the 1.5-litre Diesel engine getting a CVT automatic transmission. It also highlights the car’s new DIGIPAD 2.0 touchscreen infotainment system that supports Android Auto and Apple CarPlay. Other features listed in the brochure include an automatic climate control setup, engine start/stop button, request sensor for keyless entry, electrically adjustable and electric folding ORVM, LED position lamps, rear parking sensors with camera, fog lamps, and alloy wheels. The second-gen Honda Amaze is based on a new platform. It will come with the same 1.2-litre i-VTEC petrol and 1.5-litre i-DTEC diesel engines that power the outgoing model. However, like we said, it will get an optional CVT. The Amaze will even offer paddle-shifters, which will be a segment-first feature. In terms of design, the new Honda Amaze seems to have taken inspiration from the latest versions of the City, Civic, and Accord. No surprise, then, that it ends up looking a lot more attractive than the outgoing version. Prices of the new Honda Amaze are likely to start at Rs 5.70 lakh (ex-showroom) for the petrol variant and roughly Rs 6.5 lakh (ex-showroom) for the diesel model. As per ARAI, the diesel engine of the current Amaze gives a mileage of 25.8 kmpl. In most likelihood, this figure will be even higher for the new Amaze. It’s noteworthy here that the latest Dzire’s diesel engine offers an ARAI-tested mileage of 28.4 kmpl, which makes it the most frugal car in the market. Hence, it’s really important for the Amaze to offer a similar figure to attract the mileage-hungry car buying lot.